A Small clutch that fits my essentials. 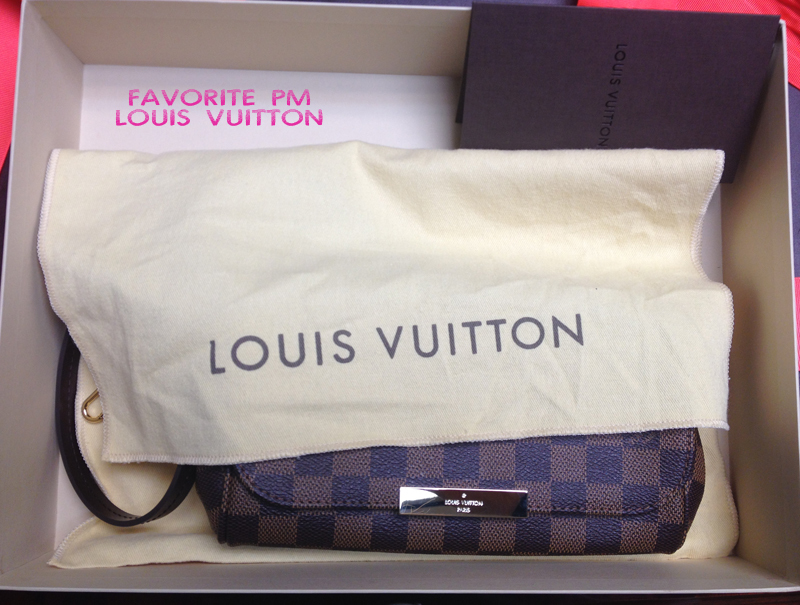 When I looked for a nice thin clutch which has plenty of room to fit my wallet and my phone and probably a lipstick, I went with LV, Favorite PM clutch. I’ve watched so many Youtube videos about clutches and found that most girls are pleased with Louis Vuitton clutch in general. Eva clutch was the talk of the town and still is. I then decided to take a look at Eva and Favorite PM size. I have pros and cons for each of the clutch. See what you think? 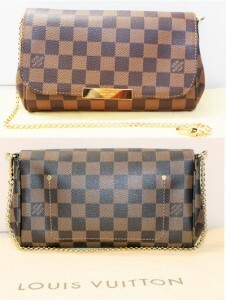 catches an immediate attention with the golden plate in the middle and golden zipper on the top. It fits my Josephine wallet and my cell phone and a lipstick. It looked amazing with its gold shoulder strap. Longer in length, good for a long wallet. The longer strap is too long for my 5.2″ height but that could be fixed. The height is limited for my agenda PM. Zipper closure, more chances to break. Taller in height, fits my agenda, my iphone and a small compact. Flap bag with a strong magnetic closure, fits more essentials if needed. Comes with shorter shoulder strap, good for petite ladies. Has an extra small compartment for my iphone. 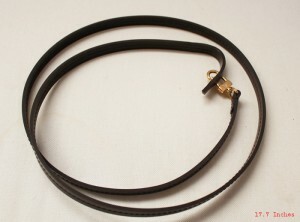 The gold strap is detachable on one end, easy to be tucked away while using the longer shoulder strap. 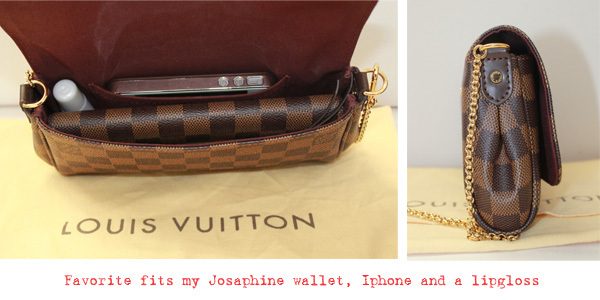 Shorter in length but fits a thin wallet like Josephine wallet and an iphone just fine. The golden plate on the front is very easily scratched. Eva clutch and Favorite PM has almost the same width which fits most of your daily essentials like a lip gloss, a think wallet, an iphone. Two shoulder straps for a cross body style and an evening like shorter strap. Very similar in price. Eva clutch is a bit cheaper than Favorite PM. Model shots. Keep in mind that I’m 5.2″.Both clutches fit right where my torso is and it is very comfortable even when filled with essentials. The Eva clutch has a D ring on one end of the zipper where you cannot detach the gold strap but the other end. I love that Eva clutch can be attached to your Neverfull or any bag that has a ring inside. Favorite PM sits perfectly just like Eva and the detachable gold strap is easily hidden when needed. 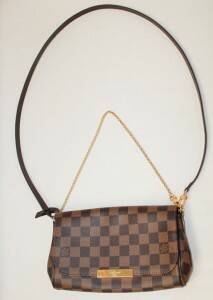 I love the long shoulder strap, looks great as a cross body bag. Front and back shots for the clutch. Check out the straps, the cow hide is 17.7″ long, great for a cross body bag. The gold strap is fancy enough for a night out. The clutch also fits perfectly for my essentials. 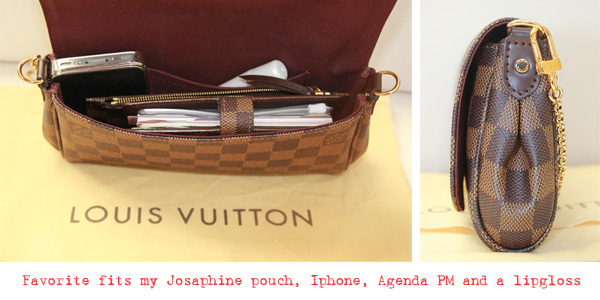 Check out my day time essentials this includes: my agenda in PM size, my small pouch from Josephine wallet, my lip gloss and iphone. Night out essentials, my wallet, iphone, and a lip gloss. I can also fit my compact if I want it to. Strap length is perfect for petite size ladies 🙂 It is about 17.7″ full length. Very easy to detach from the bag as well as hook it on. I enjoy this clutch even more just because of this fact. Drop a comment or any questions if you’d like? I think with your height, Eva clutch is very well fit! I’m 5’2 and Favorite PM sits right at my hip. Eva was hanging way down below my hip. My friend is 5’8, her Eva clutch looks great on her. Eva is certainly made for a taller girl. I bought a gold chain (a shorter length for my Favorite PM). But buying both is a like win win!! go girl. Hi there! Many thanks for great review! Hi! 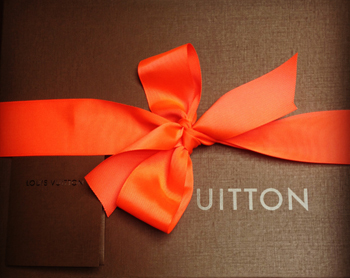 Is your favorite Made In France? Such an informative post! 3 questions…1) Is the magnetic closure on the PM pretty secure? Or does it flap open easily if brushed across? 2) Are there metal “feet” on the bottom of the PM? And lastly, 3) Does the strap/chain being attached to the zipper on the Eva bother you/look funny when you’re wearing? I think I’m leaning towards the Eva, however I’m not sure I like the look of the zipper attached to the strap/chain. Thanks for your help! 1) The magnetic closer is amazing. It’s pretty secure and it is large enough that you don’t to worry about looking for it. 2) Favorite PM and Eva clutch don’t have feet. 3) Favorite has a gold chain attached to the bag, this one you can’t take it off but you can unhook one side. This applies the same as Eva Clutch, at one end of the chain has a hook and you can clip on and off but you can’t take it off the clutch completely. You can hide the chain inside the bag and it doesn’t bother me. Over all, Eva clutch is very pretty, the catch is the length of the chain is too long for my height and I can fit my essentials much better inside Favorite PM. If you visit the LV store, have them take both clutches out so you can compare. This will bring a surprise to you. 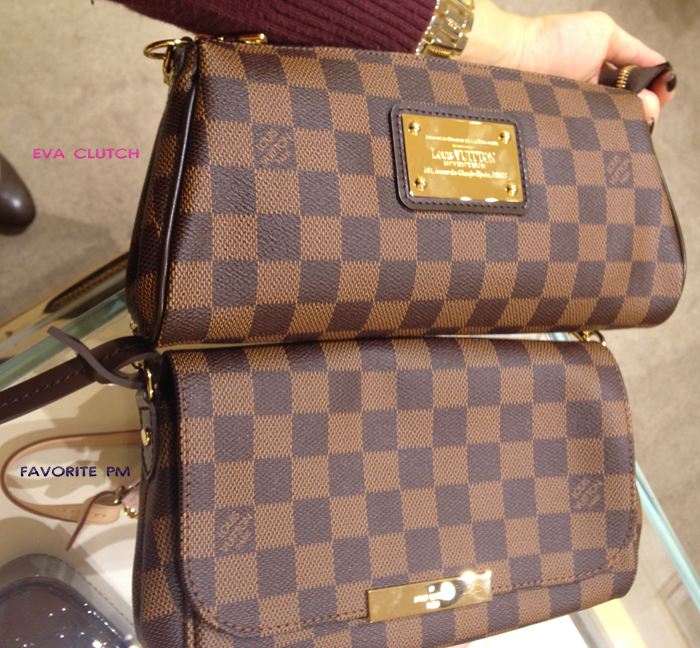 Just take your time and put all your belongings inside each clutch to see which one fits better in your opinion. i have a Favorite but in monogram style. Works well, would have been perfect if the strap is 2 more inch longer! That means you’re quite tall. I’m on a petite side, I found their leather strap fits my height pretty good. Thanks for reading. Oh wow! good for you! 5.10′ is not a problem when you have the gold chain 🙂 Thank you for reading. Hi! Having trouble with the leather strap. 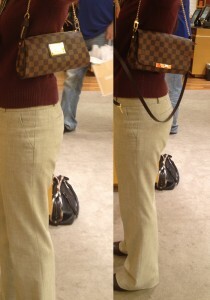 Wasn’t able to ask the LV store to demonstrate how to put it on. Canu help? Hi I have a question.. Is that favorite bag comes in red canvas lining also? And can u add picture of lv Label thanks ? I don’t think Favorite comes with red lining. I’m not sure if they have made those now? You mean the LV plate in the front of the bag? I sure can. May i know how many mm for the width of the strap? I’m sorry I missed your post back in March. I will get a precise measurement for you shortly. Thank you for reading. Can you tell me how many mm wide the gold strap is on either the favorite or the Eva or both? hi i want to know where they put the date codes in favorite damier eben?